Graduate study in agricultural and applied economics leading to a Master of Science degree in agricultural and applied economics or environmental economics and Doctor of Philosophy degree provides a wide range of educational opportunities in addressing the issues of production and distribution of food and fiber, natural resource and environmental management, and the quality of rural life. These programs prepare students for careers of leadership through development of a high degree of economic comprehension and decision making. Applications of economic theory and econometrics to resolve economic problems are the major areas of focus for courses in the department. 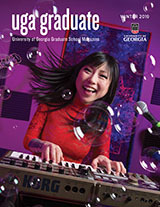 The department has offered graduate degree programs for over 55 years. Its graduates hold key positions in both the private and public sectors in the state, the nation, and throughout the world. Graduates are employed in a wide range of positions, with robust demand in private industry from health care to food and fiber wholesale firms. Graduates are employed in domestic and international academic positions. Graduate study is offered at both the masters and doctoral levels. The Master of Science (MS) in agricultural and applied economics and the Master of Science (MS) in environmental economics degrees require 27 hours minimum of course work and three hours of thesis. A Master of Agricultural Economics (MAE) degree consists of a minimum of 36 hours of course work including a technical report in lieu of a formal thesis. The Doctor of Philosophy (PhD) degree consists of a minimum of 63 hours of course work beyond the bachelor’s degree, satisfactory performance on written and oral examinations, and a formal dissertation. Graduate instruction and research may be undertaken in the following areas of specialization: agricultural marketing and consumer demand, agricultural business management, production economics, natural resources and environmental economics, and international trade and development. Graduate research is coordinated with the department’s overall research program. Students may select a research topic related to the department’s current research projects or an approved area of sponsored research. Exceptional computer facilities, software, and support are available for departmental research. Financial assistance is available to graduate students on a competitive basis in the form of departmental research assistantships. Paid internships are also available from regional and national agribusiness firms.